If you want to use Patterntesting with Eclipse you must install the AspectJ plugin AJDT. If you haven't done it add the site http://download.eclipse.org/tools/ajdt/34/update for Eclipse 3.4 and install it. Before we can add the PatternTesting library we must convert the project into a AspectJ project. 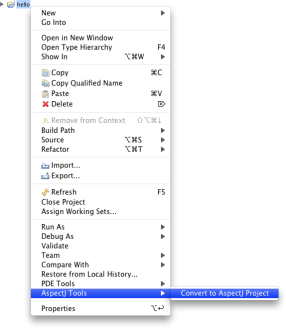 Select "AspectJ Tools > Convert to AspectJ Project" from the project's context menu (right mouse key). Next we will integrate the PatternTesting library. Download it from the download page and call the project properties. Select the entry "AspectJ Build" and then the tab "Aspect Path". Add the patterntesting.0.6.0.jar you have downloaded and press ok.